I'm a big fan of "upcycling" or just making something you already have even better with a little imagination. I have recently been sifting through my closet, pulling things that I no longer wear, and trying to make them wearable simply by changing them up a bit with materials I already had around the house. First up: this plain navy blue jersey dress. I think it was $5 at a thrift shop a couple years ago. I really like it for the summer because it's modest and comfortable, but it's just... well... plain. I've added a belt to it before, but it just needed a little more. Next, I found this tutorial on how to make frayed fabric roses. It is seriously easy, even for those who say they aren't super crafty (Kirra, I'm talking to you, friend). 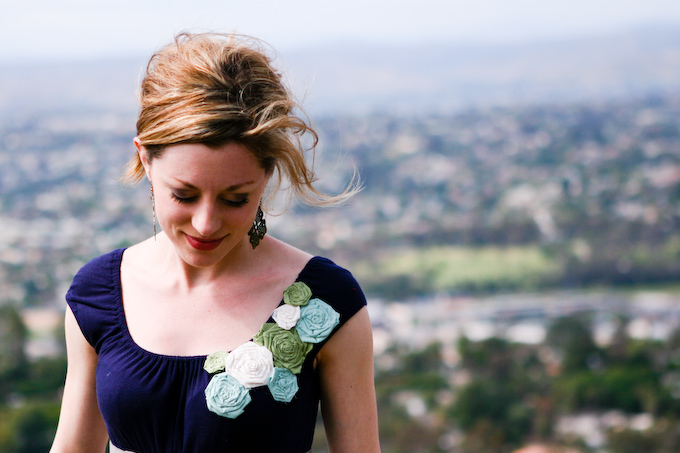 In fact, it doesn't even require sewing to make the rosette embellishments for this dress. 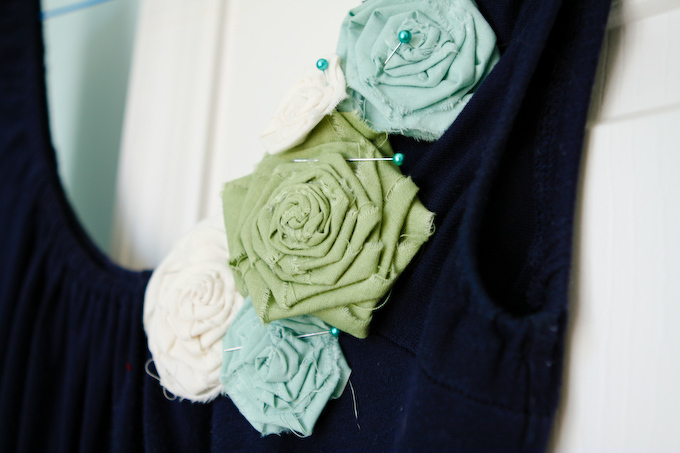 Next, pin a few of your rosettes onto your dress to see where you want to sew them into place. Finally, hand sew the flowers onto the dress one by one. By stitching them (instead of gluing them), you can easily take them off at any time you want to change up the dress. And these flowers are so versatile - you can add them to t-shirts or purses or make them in any kind of color or size. You can even make headbands or necklaces out of them. This whole process took less than an hour from start to finish, and now I feel like I have a new dress! Now I'm back to studying... I have to know the name of every bone in the body by the end of the week! Thanks Whitney! I qualify myself in the "not super crafty" category, but I'm excited to try this sometime this summer! LOVE IT! i had a feeling you made those rosettes!